With a hilt of iron, its pommel of faceted asymmetrical form cut on each face with a deep vertical flute, its straight quillons of expanding circular section decorated at their tips with incised lines and issuing from a shaped quillon-block fitted on its outer face with a small robust side-shell, a pair of grip-plates of natural staghorn secured to the tang by six tubular rivets, and hole at its tip, a continuous series of saw-teeth along its back-edge, and a latten-inlaid maker's mark on its inner face. This rare early hunting sword or Hirschänger, equipped with a saw-back blade suitable for dismembering carcasses, can be dated from its style to the time of the Emperor Maximilian I (1459-1493-1519) whose personal passion for the chase is recorded in lively detail in the woodcuts that illustrate the Theuerdank of 1517 and the Weisskunig of about 1516: both flattering allegorical accounts of his life. The sword shown here can in fact be compared in its overall form and proportions with one in the Hofjagd-und Rüstkammer, Vienna (Inv. No. Dll), made for the Emperor himself by Hans Sumersperger of Hall in Tyrol in 1496, as well as with another in the Metropolitan Museum of Art, New York (Ace. No. 29.158.704), which bears on its blade the same maker's mark as a pair of serving knives in the Wallace Collection, London (Cat Nos. A884-5), made for Maximilian's father, the Emperor Frederick III (1415-1440-1493). Since all three swords possess the same very distinctive form of quillon-block, it seems likely that they represent the products of a single, presumably Tyrolese, school. Closely related to them are two further swords from the armoury of the Emperor Maximilian I, now preserved in the Hofjagd- und Rüstkammer, Vienna (Inv. Nos. A123 and A145). Although both have slightly curved rather than straight blades, the hilt of the former in particular is strikingly similar to that shown here. All of the weapons discussed above are of a notable size, capable of being wielded with either one or two hands as desired, and are clearly to be seen as descendants of the type of 'great' hunting sword first recorded in the early 14th century. Although evidence exists for the use of such weapons as late as the mid-16th century, the tendency from the mid-15th century, and particularly the early 16th century onwards, was to employ a shorter form of hunting sword, somewhat similar to the peasant Haustoehr or Rugger, which was evidently found to be more manageable in the chase through heavily wooded country. 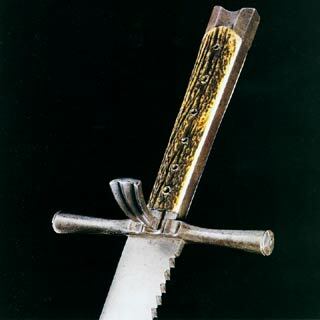 Nevertheless, as is evident from the surviving examples described above, the 'great' hunting sword still enjoyed some popularity at the court of the Emperor Maximilian I, an ardent guardian of tradition. Indeed, in his reign and perhaps also that of his father, the Emperor Frederick III, similar swords, known as Kriegsmesser, appear on occasion to have formed part of the equipment of the Imperial Guard. Fighting swords of this kind are clearly depicted in the hands of five fencers, carrying small pavises, in the splendid woodcuts of the Triumph of Maximilian, prepared for him according to his detailed instructions by Hans Burgkmair and others in the period 1512-19. These differ from the hunting swords discussed above only to the extent dial four out of five of them have longitudinally ridged blades, of a kind seen on two swords of the type in question preserved in the Collezione Odescalchi, Rome (Inv. Nos. 550-1). Very interesting sword. I find the mention of the curved blade variety timely, as this particular hilt form is one that I very much like and would like to have mounted with a curved blade as a kriegsmesser. I have always been intrigued by the various edged weapons from that region and time period. Also, very eerie, as I was just going through some pictures that I took at the Schloss Ambras armory in Innsbruck, Austria looking to see what came out, specifically messer type swords There is a great armory there and I recalled seeing some strange and unusual edged weapons there including Messers and hunting swords. I can remember many years ago seeing those types of weapons in various museums in that region and have been fascinated by them ever since. I was very happy to see that Albion will being adding two Messer types to their line. I wonder how effective that sword was at sawing carcasses. I also wonder about the hole in the end of the blade and its purpose. Hmm. I'm really developing an intrest in Messers of all kinds. I definetly think one is in my future. What an interesting weapon. That one seems to show signs of extensive use and honing from the CoP to the tip. Given the fact that it is sawbacked, I wonder what that does to the distal taper. I would think that to maintain an effective and durable sawback, the distal taper would have to be limited, resulting in a heavy blade. Do you have any information on the weight of the blade? As to the hole near the tip...could it be for the attachment of a cord to provide leverage for sawing, by keeping tension on the cord? Or to allow two men to use the sword like a double-handled (pull-pull) saw? BTW, I really like the design of the "pommel." Almost modern-looking. Maybe a tapered rod was put in the hole to serve as another handle for the saw-action. This type of rod was used for hunting/boar swords but not so close to the tip. Very strange.